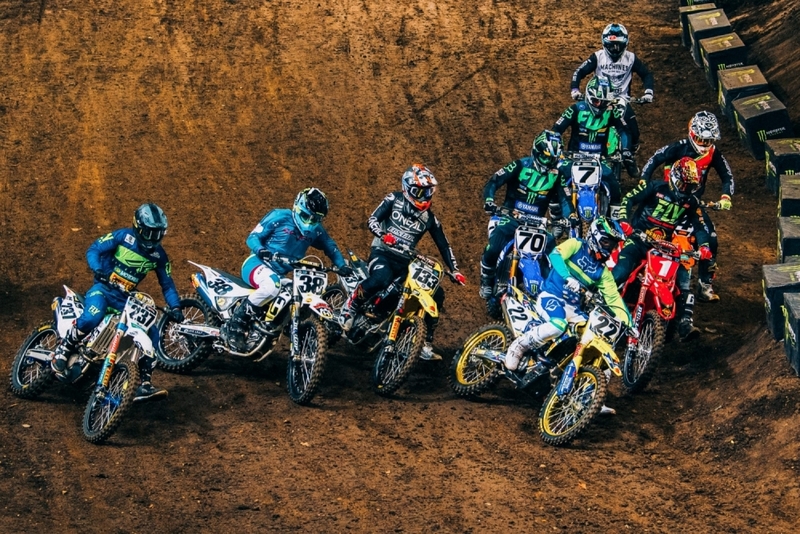 For the first time ever, in an incredible coup for sports fans, the AUS-X Open is set to run under the roof of the famed Marvel Stadium, in what will be the largest international Supercross and action sports event ever held outside of USA. The Monster Energy AUS-X Open Melbourne promises to be the biggest off-road motorcycle racing and action sports event in Australian history with Supercross, Freestyle Motocross, live music, pyrotechnics and non-stop entertainment all under one roof on November 30. Since launching in Sydney in 2015, almost 100,000 fans have been left captivated by ‘the 20/20 of motorsports’. 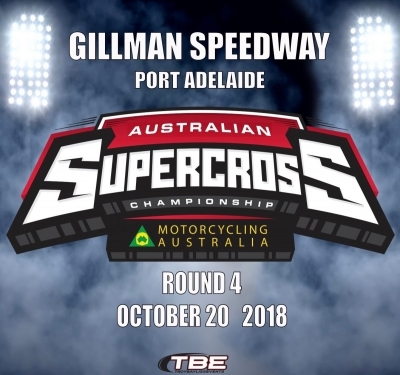 This year will be the first time ever, an international Supercross event of this scale and magnitude will be held in Melbourne, featuring the world’s best riders going head-to-head on a world championship sized Supercross track. It will also be an engineering feat, arguably unmatched by any Supercross event in the world and certainly one of the most challenging in Australian history, as supports imported and constructed in the lower level carpark, prepare to handle the immense pressure of up to 6,000 tonnes of dirt, machinery and infrastructure, all positioned in the center of Australia’s largest indoor stadium. 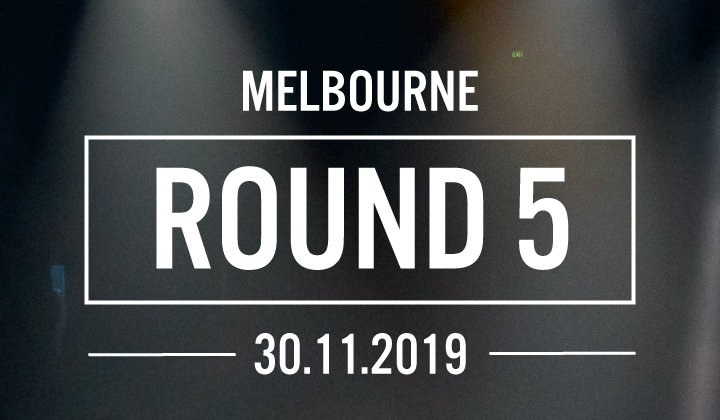 AUS-X Open Chairman – Tony Cochrane (Founder of V8 Supercars), states a move to Melbourne will open up a world of opportunity as this exciting event looks to expand and build on its already popular foundations. 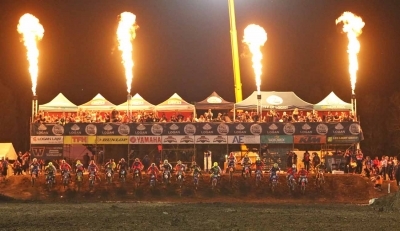 “Since its inception, the AUS-X Open has grown from strength-to-strength to a point where we’ve found ourselves in the fortunate situation of needing to expand to cater for the growing appetite of Supercross racing and more broader sports fans across the country,” Cochrane said. “The AUS-X Open Melbourne will be bigger, faster, louder, featuring more entertainment and greater accessibility to these international megastars than ever before, and I can’t wait for November 30 to showcase this amazing spectacle to the people of Melbourne. It really has to be seen to be believed,” Cochrane stated. Famed for its non-stop entertainment, suitable to audiences of all ages, the anticipation for this year’s AUS-X Open Melbourne event will be elevated to new heights, with just the one chance, to see the best Supercross riders in the world go head-to-head with the very best from Australia and New Zealand. Sparks will literally fly as some of the bravest athletes on the planet battle for supremacy and bragging rights, to win one of the world’s highest profile international events. It will be one massive night of extreme entertainment, in the heart of the always buzzing, Melbourne. Fans will be blown away by the full-sized World Championship style track, that will test man and machine like never before. The AUS-X Open will move to Melbourne from Sydney as part of a partnership with the Victorian Government via its tourism and major events agency, Visit Victoria. It has the full support of the Minister for Tourism, Sport and Major Events, The Hon. Martin Pakula. “Victoria is unmatched as the sporting and event capital of Australia and we’re so excited to bring the AUS-X Open to a world-class venue like Marvel Stadium,” said Mr Pakula. 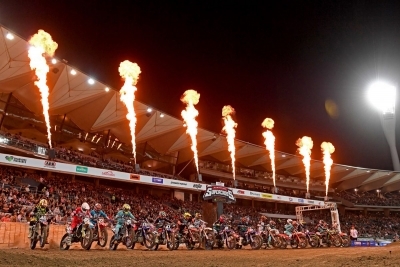 Adding even greater excitement, the Monster Energy AUS-X Open Melbourne will double as the Grand Final round to the 2019 Australian Supercross Championship, much to the delight of Peter Doyle, the CEO for the sanctioning body for Supercross racing, Motorcycling Australia (MA). 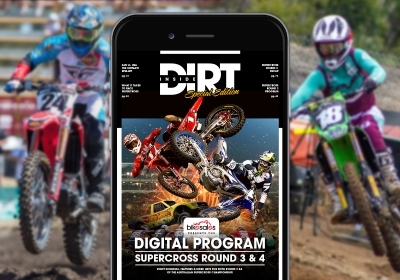 “The Australian Supercross Championship is Australia’s premiere off-road motorcycle racing Championship. To have the grand finale here in Melbourne, at an incredible event like the AUS-X Open, is a huge positive for the sport and fans alike,” said Doyle. Michael Green, Chief Executive Officer of Marvel Stadium, said the venue is thrilled to host world-class sporting talent along with thousands of avid fans. “We are very excited to work alongside AUS-X Open as the host venue for what will be a great event,” said Green. International Freestyle Motocross athletes will once again push the realms of possibility, attempting the biggest and best stunts ever seen on two wheels, in the FMX Best Trick competition. Featuring live music and entertainment, giveaways, stunning pyrotechnics and more; the AUS-X Open Melbourne is an incredible entertainment spectacle for all ages. Tickets start from $39.99*. For more information and the exclusive opportunity to sign-up to access tickets during the pre-sale before they’re on sale to the public, you must ensure you sign up to an exclusive Pre-Sale ticketing opportunity at www.ausxopen.com. Pre-Sale tickets will be available May 15th followed by Public On-Sale on May 21st via Ticketmaster. 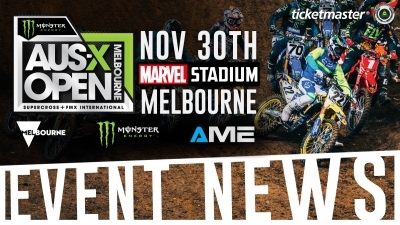 The AUS-X Open Melbourne is the final round of the Australian Supercross Championship and is sanctioned by Motorcycling Australia (MA). Stay tuned to SX Open Supercross on social media for some truly amazing upcoming announcements that are sure to blow fans away in 2019 at Marvel Stadium. Where will you be on November 30? MARVEL STADIUM, DOCKLANDS, VIC 3008.